(11:25 a.m. BST) -- Cunard will mark the 50th anniversary of the launch of its iconic Queen Elizabeth 2 vessel with a special voyage on Queen Elizabeth next month. Launched by HM Queen Elizabeth II on 20 September 1967, QE2 sailed until November 2008, following 41 years of service. Queen Elizabeth will embark on a special 17-night return voyage from Southampton on 8 September to mark the occasion -- calling in Spain, Italy, Greece and Croatia -- with five celebratory theme days taking place during the sailing. Themes will include "Moving in Royal Circles," which will focus on the relationship between the QE2 and the Royal Family, and "The Falklands," which will look at the ship's service during the 1982 conflict. Celebrations will culminate with "QE2 Day" on 20 September, as the ship spends the day at sea. Highlights will include a QE2 ball, special QE2-themed menus, past-passenger gatherings, QE2 quizzes and guest talks as part of the line's Insights Speaker programme. Captain Ian McNaught, the QE2's last master; Commodore R. W. Warwick, who served as QE2’s Captain for 13 years; Maureen Ryan, a QE2 social hostess; and Chris Frame, a maritime historian and author will all appear on the special sailing. 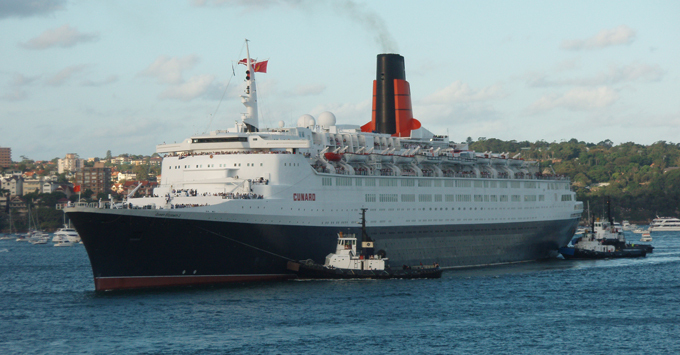 Cunard's Vice President, Angus Struthers, said: "When QE2 came into service in the 1960s, many critics said she wouldn’t last a decade in the age of the jet but her unique design as a dual-purpose ship meant that she was versatile enough to operate both as a transatlantic liner and a cruise ship." Struthers added: "Given how famous and loved she was, we felt this was a great opportunity to pay tribute to this Cunarder’s remarkable life onboard our newest ship, Queen Elizabeth; herself designed to offer a perfect luxury cruise holiday." Following the ship's retirement by Cunard, it was sold for £64 million to Istithmar -- part of the state conglomerate Dubai World -- who had planned to turn it into a luxury hotel. However, when the global financial crisis struck, the company ran out of funds to pursue the project and the ship has since been left to languish in Dubai's Port Rashid. --By Kerry Spencer, Editor, U.K.